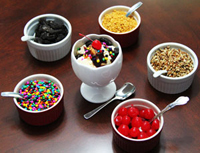 Our Ice Cream Parlor has dishes, scoops, topping jars & more. Everything you need for an old fashioned ice cream parlor sundae is here. Click the links below to get started.